Social Security System (SSS) – The SSS was created to provide private employees and their families protection against disability, sickness, old age, and death. The Government Service Insurance System (GSIS) is the equivalent system for Philippine government employees. Home Development Mutual Fund (HDMF) – The HDMF, also known as the Pag-IBIG Fund, is a provident savings system supplying housing loans to private and Philippine government employees, and to self-employed persons who elect to join the Fund. Philippine Health Insurance Corporation (PhilHealth) – PhilHealth is administered by the Philippine Health Insurance Corporation, and provides employees with a practical means of paying for adequate medical care in the Philippines. All employed persons under the age of 60 who earn a monthly income of more than P1,000 are required to contribute to the three social insurance funds previously mentioned. Government employees under the retirement age of 65 and officers of the Armed Forces of the Philippines (AFP), Philippine National Police (PNP), Bureau of Fire Protection (BFP), Bureau of jail Management and Penology (BjMP), and the Philippine Coast Guard (PCG) who are under the age of 60 are mandated by law to contribute to the GSIS. Both private and government employees must contribute to the Pag-IBIG Fund and PhilHealth. Membership is optional, however, for self-employed persons, Overseas Filipino Workers (OFWs), and Non-Working Spouses (NWSs). Foreign nationals working in the Philippines must also make contributions to SSS, HDMF, and PhilHealth. Membership is mandatory unless exempt under some of the Philippines’ Totalization Agreements. Employee’s SSS contributions are deducted from their salaries and withheld by their respective employers on a monthly basis. Employers have a share in the monthly contribution. The updated SSS monthly contribution for employed members with monthly incomes of P15,750 and over is P1,760. The employer is required to contribute 7.37% or P1,178.70 from this amount while the remaining 3.63% or P581.30 should be withheld from the employee’s salary. 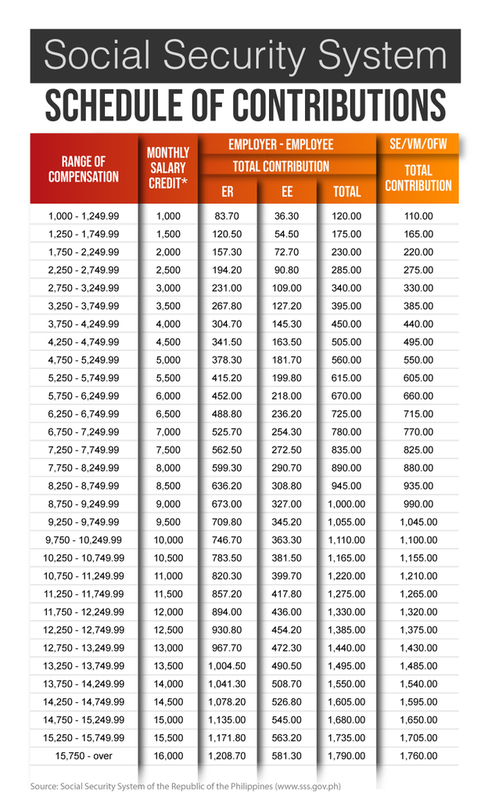 A more comprehensive table which consists of the overall contribution scheme of the SSS can be accessed here. Contributions to Pag-IBIG Fund is set at P200 and must be equally shared by both employer and employee. Effective January 2018 onwards, monthly premium contributions to PhilHealth will be 2.75% of the employee’s basic monthly salary and will be shared equally by both employer and employee.